While technically they are the Bolts of Frankenstein’s Monster, everyone knows what you’re talking about and you don’t need to make such big deal and remind me every single time, Kyle. 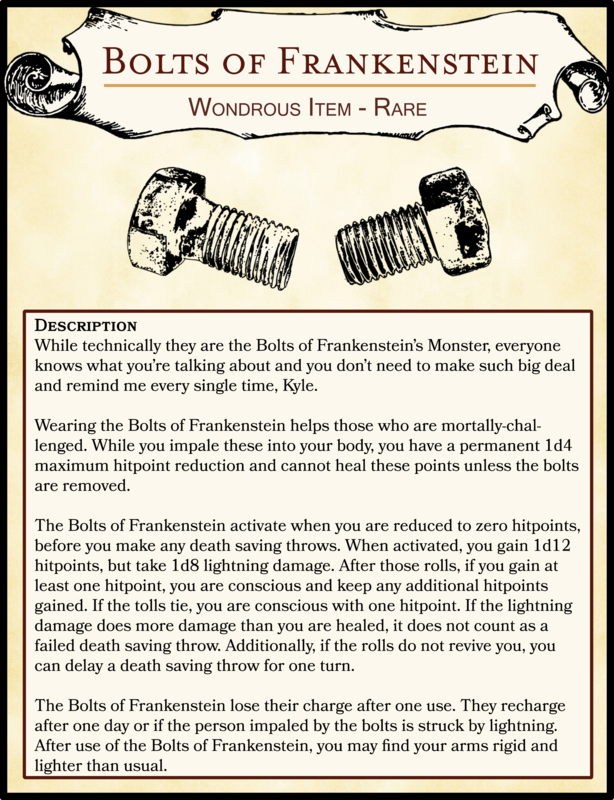 Wearing the Bolts of Frankenstein helps those who are mortally-challenged. While you impale these into your body, you have a permanent 1d4 maximum hit point reduction and cannot heal these points unless the bolts are removed. The Bolts of Frankenstein activate when you are reduced to zero hit points, before you make any death saving throws. When activated, you gain 1d12 hit points, but take 1d8 lightning damage. After those rolls, if you gain at least one hit point, you are conscious and keep any additional hit points gained. If the tolls tie, you are conscious with one hit point. If the lightning damage does more damage than you are healed, it does not count as a failed death saving throw. Additionally, if the rolls do not revive you, you can delay a death saving throw for one turn. The Bolts of Frankenstein lose their charge after one use. They recharge after one day or if the person impaled by the bolts is struck by lightning. After use of the Bolts of Frankenstein, you may find your arms rigid and lighter than usual.